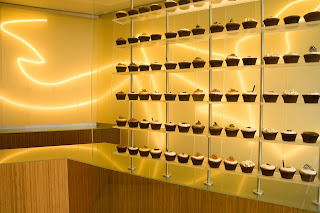 Just when Chicago thought the couture cupcakes at MORE (One E. Delaware St., Chicago; 312-951-0001) couldn’t get any better, owner Patty Rothman has whipped up some fun promotions to accompany her delicious one-of-a-kind treats. During the month of October, the customers of MORE not only have a chance to sample an array of autumn-themed cupcakes to celebrate the beginning of fall, but they are invited to participate in exciting events. Chicago is witnessing a once-in-a-lifetime event with two hometown baseball teams in the Playoffs and MORE is in on the action. The day of or the day following a Cubs or Sox Playoff win, customers decked out in the winning Chicago team’s garb are invited to visit MORE (One E. Delaware St., Chicago, IL). And with a purchase of six cupcakes, the decked-out fan will receive a free “MORE” cupcake. 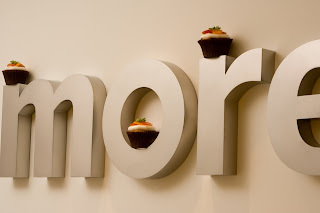 * The “MORE” is a delectable and decadent chocolate cake cupcake, filled with oozing homemade marshmallow, and iced with a silky chocolate ganache, fast becoming a favorite flavor at this newly opened Gold Coast bakery. While the teams score more and win more, the fans score MORE and win MORE, and will of course, want MORE. This promotion will run for the duration of the playoffs as long as a Chicago team stays in, which leaves the fans only one option: don your favorite team apparel, cheer on your team, watch them score and get thee to MORE! * A customer wearing both Sox and Cub attire at the time of a six-cupcake purchase does not grant him or her two free cupcakes, just two times the opportunity to gloat. Starting now until the November 4 Presidential election, MORE will take a bipartisan view and feature both “Obama” and “McCain” cupcakes. Both cupcakes are a rich, cocoa-embodied red velvet cupcake, topped with the signature MORE cream cheese frosting, however the only difference between them lies in the simple star propped upon the pillows of frosting. A red star stands for the McCain-Palin ticket, while a blue star represents the Obama-Biden ticket. With their Presidential Cupcakes, MORE encourages customers to “Vote Early and Vote MORE” as they will be tracking the sale of each Presidential cupcake and updating the results; a mouth-watering Gallup Poll indeed. MORE employees will also be donning the trademarked “Vote MORE” t-shirts which will be available for politically-minded customers to purchase and sport while snacking on their favored Party’s cupcake. If only the actual vote tasted this good. October is National Breast Cancer Awareness month, and with one in eight women still being diagnosed with breast cancer, MORE hopes to use sweetness in the fight against cancer. The "Hope MORE" cupcake, a treat worthy of this cause, features a pink velvet cake base with luscious white frosting and pink white chocolate curls. A portion of the sales of the Pink cupcake will go directly to numerous local and national breast cancer charities. Enjoy a Pink cupcake and hope MORE for a cure.